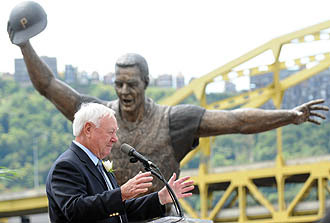 How did the Pittsburgh Pirates play on the day they unveiled the long-awaited Bill Mazeroski statute? Let's just say we've seen this outcome a time or 90 already this season. Following an emotional pre-game ceremony introducing the newest piece of sports art to the city, Charlie Morton's Great Stuff dropped to 1-11 as the Pirates starter in an 8-1 loss to lowly Washington (59-78). The defeat came just a day after a 9-2 loss to the Nationals on Saturday, giving last-place Washington a 17-3 advantage over the last two games of the series. Sunday's game followed a familiar script: Morton and his teammates dig a significant hole (eight hits, two walks, six runs in 3 2/3 innings), and can't dig their way back out against a lousy pitcher - in this case, Jason Marquis (2-7, 7.14). Of Morton's outing, leave it to John Russell for a quote like this: "Charlie looked better, a little more aggressive." Only a pitcher who's performed as bad as Morton could have an eight-hit, two-walk, six-run, 3 2/3-inning performance be characterized as "looking better". But on the bright side, he did lower his ERA to 9.66. And then came the money quote from Neal Huntington, who cranks them out like Pete Rose cranked out base hits: "Charlie has good enough stuff that he should be a major-league player," Huntington said. And the legend of Charlie Morton's Stuff lives on. Dejan Kovacevic cited Morton's bad luck in his game wrapup (of which Morton did have some on Sunday), mentioning three Pirate errors. But he neglected to mention that one of the three Pirate errors was made by Morton, which defeats that bad-luck storyline a bit. And even without the unearned runs that his defense helped make happen, Morton still yielded eight hits and two walks in his brief outing. Since rejoining the Pirates, Morton has given up 14 runs (nine earned) and 17 hits in just seven innings. Excuse me if I fail to break out the party-poppers just yet in celebration that Great Stuff Morton is turning the corner. The good news, if any, was that the young Pirate nucleus made solid contact on Sunday, with two hits each from Andrew McCutchen and Jose Tabata, three from Neil Walker, and a home run (his 11th) from Pedro Alvarez. But even with said hits, the team still had only one player cross home plate, and when you're facing Jason Marquis, that's just not good enough. Speaking of not good enough, the Pirates fell to 1-5 this season against the Nats. Next up for the 45-91 Bucs is a three-game set against Atlanta that starts Monday afternoon at 1:35. Brian Burres and Tommy Hanson are the starters for a Labor Day tilt at PNC Park. Following the Braves series, the Pirates head to Cincinnati for a three-game series against the division leaders, and Morton will take the hill next on Saturday against Aaron Harang.